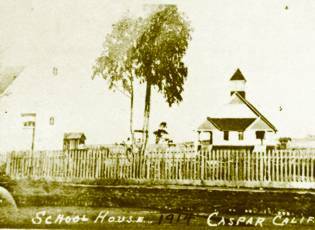 The Caspar School District was approved September 14, 1865, bounded on the south by the Russian Gulch, on the west by the Pacific Ocean, and north and east by Big River Township. Around 1900, a schoolhouse was built across from the company store, Apparently, this school caught fire from a spark from a passing train and the class were transferred to the Good Templars Hall up across from the hotel. Then about 1912, it is believed, the first section of the present schoolhouse was built. That year, so the report goes, a tornado came through town and tore up the ship-loading chute, scattered piles of lumber and knocked the school privies this way and that. The second room of the school was added in 1914. The first graduating exercises in the history of the Caspar School were held on the afternoon of June 18, 1920. After 8th grade, most Caspar students went to Mendocino High School, but a touring car bus picked up students who attended Fort Bragg High School. The popular consensus on the size of Caspar at that time was, according to Mrs. Elgin, principal and teacher of 5th, 6th, 7th and 8th graders of Caspar School, "You could shoot a cannon down Main Street and not even hit a chicken." In 1949 there were 44 students at Caspar school, and only the 6th, 7th and 8th graders attended junior high school in Mendocino. Population of Caspar at that time was around 450. In 1966 Caspar School was no longer in use as a regular school. The Head Start program started a child development center there in October, 1966. There were 23 children, ages three and four. 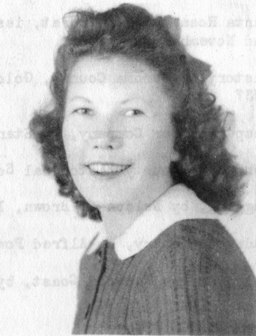 Ann M. Connor graduated from Caspar Elementary School in 1936. 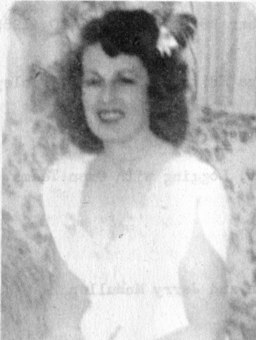 Mabel Johnson graduated from Caspar Elementary School in 1930.